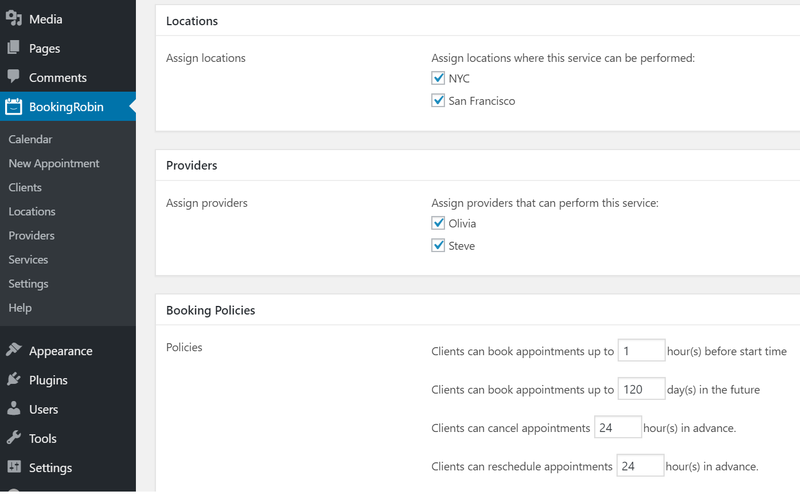 Under WP Admin > BookingRobin > Services, list the different services that your business offers. Click "Add New" to add a new service. This is how long the appointment lasts in hours and/or minutes. Enter the amount of time you actually spend with the client performing this service. If you want to build in a buffer between appointments, add padding time before and/or after appointments. This will automatically block extra time before and/or after this service, so clients can't schedule back-to-back. It is the total amount of money clients should pay for this service. By default, the time slot interval is the sum of service length and padding time. You could enable Flexible appointment start time to have an alternative time slot interval. 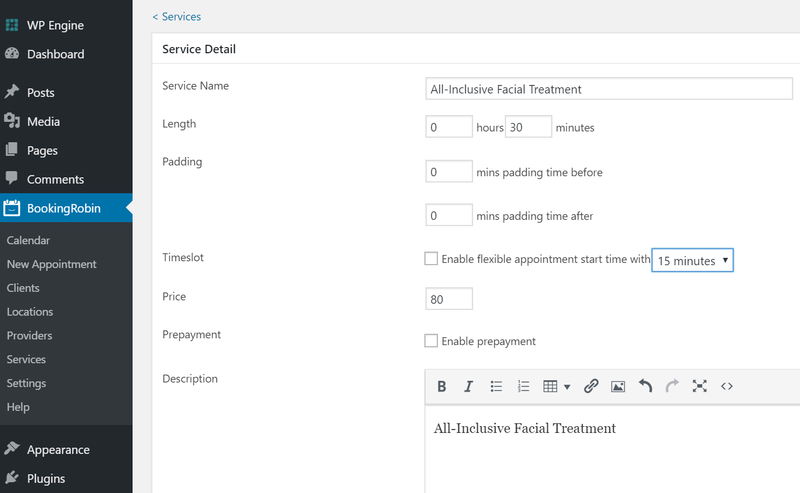 If you want to charge clients at the time of booking, enable Prepayment and set the amount you charge for clients to hold appointments. This amount will be charged when clients submit booking forms, and appointments will be added to the calendar only when payments are processed successfully. Do not forget to enable Stripe and/or Paypal to accept online payment at WP Admin > BookingRobin > Settings > Payments tab. For more info about how to enable Stripe and/or Paypal, read here. Under Locations section, assign locations where this service can be performed. Under Providers section, assign providers that can perform this service.